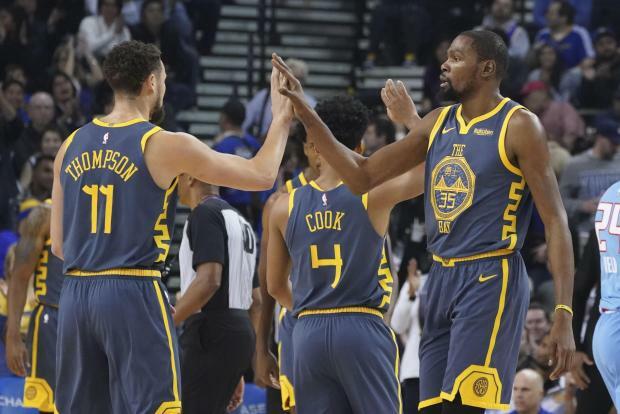 Kevin Durant poured in a game-high 44 points, including 17 in the fourth quarter, to help the Warriors outrace their Northern California rivals down the stretch en route to their second home win in two nights. Golden State snapped a four-game losing streak with a 125-97 triumph over Portland on Friday. Buddy Hield had a team-high 28 points for the Kings, and Marvin Bagley III added 20 points and 17 rebounds off the bench. With the Kings leading 116-115, Durant missed a jumper with about 20 seconds to go. Andre Iguodala got the offensive rebound, and Thompson's 6-foot jumper was blocked by the Kings' Willie Cauley-Stein, but Thompson got the ball back and made the layup. Giannis Antetokounmpo finished with 34 points, 18 rebounds and eight assists as host Milwaukee rallied past San Antonio. Milwaukee outscored San Antonio 40-27 in the fourth quarter for its fourth win in its past five games. Malcolm Brogdon had 23 points on 10-of-15 shooting, Khris Middleton chipped in 21 and Eric Bledsoe had 20 points and 10 assists as the Bucks' starting five combined for 107 points. DeMar DeRozan scored 34 points for the Spurs, who lost for the sixth time in their last eight games. Bryn Forbes had 18 points, Davis Bertans scored 17 and LaMarcus Aldridge added 15. Jamal Murray scored 22 points with eight rebounds and eight assists while Nikola Jokic and Trey Lyles added 16 points each as Denver got off to a hot start and held off host Oklahoma City. Juan Hernangomez had 15 points for the Nuggets, who have won three games in four days, having won at Minnesota on Wednesday and at home against Orlando on Friday. Paul George had 24 points with 11 rebounds, and Russell Westbrook finished with a triple-double -- 16 points, 10 rebounds and 12 assists -- as the Thunder lost for just the second time in their last seven games. J.J. Barea finished with 20 points, eight assists and a pair of steals in 26 minutes off the bench as host Dallas won for the seventh time in nine games, beating Boston. Barea scored seven points in the definitive opening seven minutes of the fourth quarter, including a 3-pointer with 5:44 to go putting Dallas ahead 103-90. The lead grew to 16 moments later, and struggling Boston was unable to recover. The win got the Mavericks to .500 for the first time this season, and Boston, playing without Gordon Hayward due to ankle soreness, fell back to a .500 record after 20 games. Jayson Tatum led five Celtics in double figure with 21 points. Rookie Collin Sexton scored a career-high 29 points in his eighth consecutive start, and Tristan Thompson recorded his third consecutive double-double as host Cleveland defeated Houston. Sexton, starting for the injured George Hill, shot 14-for-21 to lead a balanced Cleveland offense. Thompson finished with 16 points and 20 rebounds. Chris Paul had the night off for the Rockets. James Harden took over the point guard position, scoring 40 points with 13 assists. Otto Porter Jr. scored a season-high 29 points, John Wall added 22 points, seven rebounds and eight assists and host Washington defeated New Orleans. Austin Rivers scored 18 points off the bench, and Bradley Beal had 18 points and eight assists for the Wizards, who had lost three of their last four games. Porter made 12 of 15 field-goal attempts, including 3 of 4 from 3-point range. The Pelicans, playing without leading scorer Anthony Davis (right hip strain), completed an 0-3 road trip and fell to 2-9 away from home. Julius Randle, starting for Davis, led New Orleans with 29 points, 15 rebounds and seven assists. Karl-Anthony Towns scored 35 points and pulled down 22 rebounds for his 10th double-double of the season, and Minnesota pulled away to beat Chicago in Minneapolis. Derrick Rose added 22 points on 9-for-13 shooting off the bench to help knock off his former team. Jeff Teague finished with 18 points for Minnesota, which has won back-to-back contests to climb two games within .500. Zach LaVine scored 28 points to lead Chicago, which lost for the sixth time in seven games. Jabari Parker had a season-high 27 points, and Justin Holiday registered his second consecutive double-double with 14 points and 11 rebounds.